Series: The Art and Practice of Prayer. This curriculum is to start the discussion as to what prayer means and how we regain a practice that is at the core of who we are. We will hear from theologians and thinkers who share their own journeys of prayer. Part of the curriculum will provide suggestions for practices that can either be done alone or communally. If you have questions, contact Sharon Bartells or Debbie Thomas. Sundays at 12:00 NOON. February 24, 2019 through May 5, 2019. more . . .
Monday and Tuesday Women’s Bible Study is reading and discussing "The Story" on. All are welcome! If you want more info, contact Gail Kviz 817-232-3996. Have you ever asked yourself: How should I pray? How am I supposed to find time to serve? I don’t know how to read the Bible. Looking at my budget, how am I supposed to give? Each Sunday in Lent, the 9:30 Adult education class will take a look at the theme for the week. Come explore in depth how we can live these marks of discipleship. 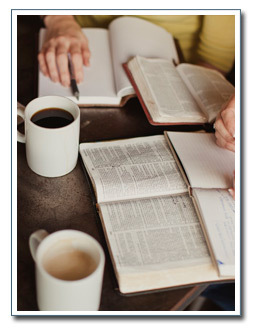 Get some strategies for reading the Bible. Learn different ways to pray. Think about worship, serving and community in new ways. You are invited to stretch and grow your faith this Lent! Pastor Phil and the folks from Kyrie meet every Tuesday @ 7 PM at Grand Cru Wine & Beer, 1257 W Magnolia Ave, Fort Worth. Any changes in location are advertised on Kyrie’s Facebook page..
Tuesday at 7 p.m., at a local restaurant. Pr. Kyle and Ashley Loest lead a Young Professionals (20s & 30s) faith & fellowship. 7 p.m. for dinner, 8 p.m. for discussion. For the restaurant location, contact Ashley Loest (817-875-6374, ashleyloest@gmail.com). Podcast: Hotdish! Pr. Kyle’s podcast! The mission of "to hell with the hotdish" is to help the church laugh at ourselves and be challenged at the same time. New episodes every other week. Sign up for our email list at tohellwiththehotdish.com, or find us on your favorite podcast catcher!